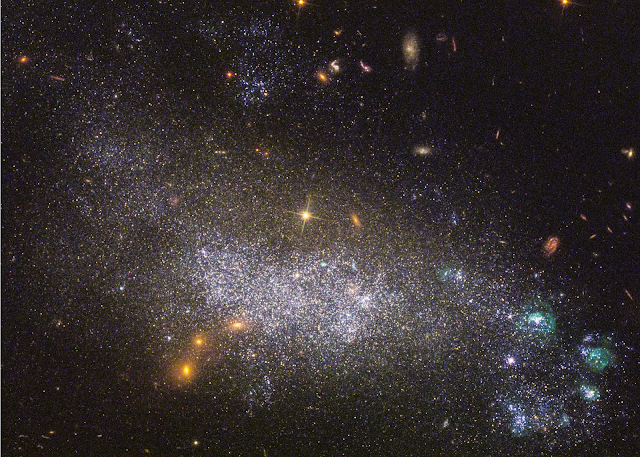 The dwarf galaxy DDO 68, also known as UGC 5340, lies about 40 million light-years away from Earth. Due to its proximity it became one of the 50 targets of LEGUS. In UGC 5340, a pocket of rapid star birth appears in the lower right corner. This region of star formation was probably triggered by a gravitational interaction with an unseen companion galaxy. But star formation is present across the entire body of UGC 5340, and the relatively young stars are responsible for the galaxy’s blue-white color. An image of this galaxy was already released back in 2014. This newly-processed image now also shows ultraviolet radiation Hubble captured from the galaxy.